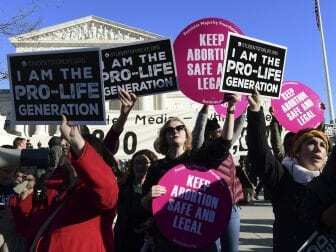 ALBANY, NY (WSKG) – The New York State legislature is poised to approve a bill to codify the abortion rights in the US Supreme Court decision Roe v Wade into state law. For supporters, including the majority of Senators and Assembly members, it’s been a long time coming. But for opponents , it’s a bitter disappointment. The legislation was blocked for a dozen years in the state Senate, because Republicans who held the majority did not permit the bill to come to the floor for a vote. Now, with the election of several new Democrats to form the ruling party in the State Senate, they’ll join the Democrats who lead the Assembly to likely pass the bill on the anniversary of the Court’s 1973 decision on Roe v Wade. The state’s current laws decriminalize the procedure for pregnancies up to 24 weeks. After that, abortion is only permitted to save the life of the mother. It is not allowed to preserve a woman’s health. As a result, some New York women with rare conditions that led to late term pregnancies that were considered dangerous to their health had to go out of state to get an abortion. “To have New York come out of the box fast, early in the legislative cycle and make this definitive statement can be really inspiring,” Miller said, especially, she said, in wake of mid term elections where many candidates ran and won on the issue. Gallagher says the Reproductive Health Act goes beyond the rights established in Roe v Wade. She says a provision that permits a “licensed, certified, or authorized practitioner” to perform an abortion means it would allow health professionals other than doctors to provide the procedure. She says it could also weaken criminal penalties in cases where domestic violence leads to the loss of a fetus, because the procedure would be removed from the state’s criminal statues and instead be under the public health laws.